In the 1960’s and 70’s, many artists liked the idea of repetition, presenting different variations on a particular theme. Take Andy Warhol’s iconic ‘Monroe’ series of paintings, or Sol LeWitt’s repeated geometric structures, for instance. It has been suggested they may have been influenced somewhat by the enigmatic photographer, Edweard Muybridge, who was trying to prove that, at one moment in the flight of a galloping horse, all four feet were physically off the ground. In order to achieve this, he had to devise a system of ‘stills’ as no-one up to then had been able to see this with the naked eye. Thus the idea of ‘series’ or sequence was born. To me as an artist, this feels entirely logical, as I often work through ideas in a series of different variations based on a particular theme or idea. When I was working on my ‘Geology of the Lizard’ series, I took pebbles (just a handful!) 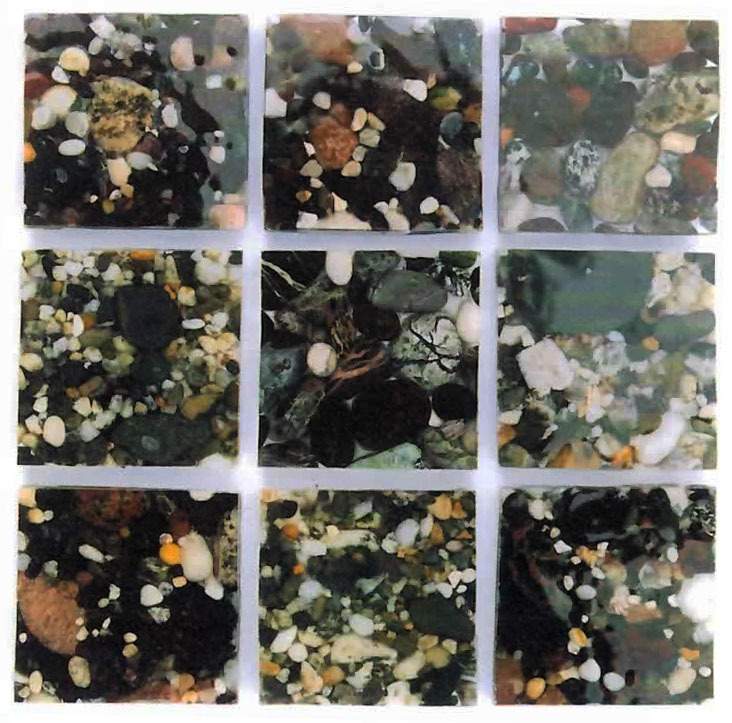 from different beaches around the Lizard peninsula, set them into resin and cut them to fit into a grid arrangement by way of a ‘contrast and compare’ exercise.